When a door is off track the resulting issues vary from having to take apart the entire door and reinstall to simply having to put a few rollers back into the track. Regardless of the issue it is usually a good idea to call a garage door company to help with this because almost always the spring(s) are still under tension and attempting to fix the problem yourself could result in injury or at the very least additional damage to your garage door. You can typically find cables on each side of the garage door. Cables can come off the drum or unraveled for several reasons including lost tension in the spring over time, incorrect springs installed by incompetent Garage Door Technicians or an object obstructing the path of the door. When a cable comes off the drum the fix can be as simple as loosening the drum and installing the cable back onto the drum. But sometimes the repair can be more complicated requiring work on both the left and right cables and drums and or sometimes the spring itself. 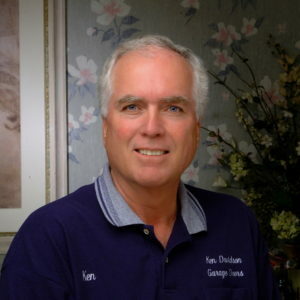 If you’re not certain please call Ken Davidson Doors and let us help you get your door operating better than ever. Although Ken Davidson Garage Doors only sells Liftmaster garage door openers we service all makes and models including Genie, Craftsman, Chamberlain, Marantec and more. Never underestimate the power of an upgraded nylon 13-ball bearing garage door roller. We love the response we get from our customers after they’ve made the decision to upgrade from standard metal garage door rollers to our lifetime warrantied nylon garage door rollers. The difference is simply amazing. The new nylon garage door rollers are quieter, smoother and will last much longer because they are a sealed bearing which means that dust and debris can’t get into the bearing area causing the bearings to eventually seize which in turn places additional stress on the garage door springs. Have you ever thought much about how your garage door operates? My guess is probably not. If you’re like most folks you just know that when you hit the garage door button on the wall or press the garage door remote in your car that your garage door goes up or it goes down; until it doesn’t any more. If you own a commercial overhead door in Claremont, or if you are interested in replacing torsion springs, or if it is a heavy garage door, we recommend to you to use the services of a garage door specialist in Claremont to perform the spring replacement for you. A garage door spring replacement can be dangerous, and the best thing to do will be to use the services of a garage door expert in Claremont, how have the knowledge and the experience to fix any garage door spring in Claremont. The first you should do on your way to garage door spring replacement is to locate a garage door supplier who sell garage door parts in Claremont. Once you located a garage door supplier in Claremont, the next thing will be to get the right spring for your overhead garage door in Claremont. We would like to make it clear that not all garage doors in Claremont are the same, and that a spring that can perfectly fit your garage door in Claremont, will not necessarily fit your garage door in Claremont. So you need to make sure that you purchased the right spring for your door. Now it is the time to make it clear that we usually replace both garage door springs, and we recommend you to do the same to maintain the safe operating of your garage door in Brooklyn, and to make sure that the door will remain balanced. risks. If you are not sure, or if you have questions on how to fix a garage door spring in Claremont, contact us for a same day service. After servicing garage doors in Claremont, we have the knowledge and the ability to fix every broken garage door. Whether it is a broken garage door in Claremont, or a roll up gate repair in Claremont, no garage door repair is too complicated to us. And replacing garage door spring in Claremont is something that we do on a daily base. We carry with us springs to fit all garage doors in Claremont, and we can be there today. There is no need for long waiting, and there is no reason why we won’t be there at your convenience. All you need to do if you want your garage door spring replaced today is to give us a call for emergency garage door repairs in Claremont. When it come to a commercial garage doors in Claremont, we know that the time is one of the most important thing. That is why we offer a 24-7 commercial garage doors repair service in Claremont. A commercial garage door should be strong and reliable. That is the reason that when it comes to commercial garage doors in Claremont, we will always use the best and the strongest garage doors materials that in the market today. A commercial garage door that need a repair, can cause – except from the loss of money – to a lot of frustration. That is why we highly recommend to perform a maintenance service for every commercial door at least every 6 months. That way you can make sure that the garage door will work perfectly, and if there is a problem with the door, the technician will find and fix it, before the garage door will stop working. We know how important it is for you, to get your garage door fixed ASAP, and even more when it comes to commercial garage door. That is the reason why we are offering a 24-7 emergency garage door repair in Claremont. All you need to do is contact us, and one of our experts will be on he’s way to help. Should I try and force the door to work? One of the most dangerous things you can do, especially when it is an issue of commercial overhead door or a rolling gate in Claremont, is to try and force the door to work. The commercial doors and gates can weight hundreds of pounds, and trying to force them or to push them aggressively can result with serious injuries. The best thing that you can do is to contact a contractor that specialize in commercial overhead doors in Claremont to come and assist you with the issue. At the same time, you can ask the contractor to lubricate the door, tune it, and to make sure that the door is safe for use again before he leave the place. and make sure that there are no broken parts, or that the door is in a perfect condition. Do not ignore the problem, since from our experience, it will only get worst. If you see a problem, or if you think that there may be something wrong with the door, STOP USING IT, and contact a garage door company in Claremont. always be unplanned “surprises” that you did not prepare for, and in that part the experience and the knowledge is so important. We sometime replace torsion springs with completely different springs. When we notice that the old spring are no longer good for this particular door, we prefer to completely remove them, and install the right springs for the door, determined by the weight the size and other parameters we calculate when replacing torsion spring. Claremont garage doors and gates provide residential garage doors service in Brooklyn New York. Whether you need a garage door repair, or a garage door installation, you got to the right place. From broken garage door spring repair, to garage door opener installation, we are here for you. Among other services, we offer garage door tune up, which include garage door lubrication, opener adjustment spring adjustment and garage door inspection. It is important that you will provide the garage door with a maintenance service at least twice a year, to make sure that the door will continue to work, and to maintain its parts. We, at Ken Davidson Garage Doors, know how important for you and for your family, to have a garage door door you can rely on and that functions perfectly whenever you need it. We offer a large variety of residential garage doors, so you can find the perfect garage door, one that will work for many years in a perfect and silent way, like every garage door should. Every garage door installation in Claremont, start from 2 basic things: Using a high quality garage doors and parts, and a professional garage door contractor to perform the installation. Because a garage door replacement is something you need to do once, and not to repeat it. One of the most frustrating things, is to install a new garage door, just to find out after few weeks that the door is stuck, and need to be fixed. a reputation that we would like to maintain. installed in case the spring, which carry lot of tension, will break. In that case, the safety cables will provide protection from the broken spring, to people or objects which located close to the door. from 2 parts – the first is removing the old door, inspect the garage door frame to make sure that it isn’t lose or damaged, installing the new garage door, and then installing the opener (in case there is one). There are many things you should consider when you are thinking about replacing your garage door: From color, to design through size and materials, there are countless options when it come to new garage door. But don’t worry, we are always happy to share our experience in the garage door field, and we will be happy to send one of our techs, to assist you finding the right garage door for you. A high quality garage door that was installed by a professional tech can last for many years. We always advice our customers to spend few more dollars, and by that to get a high quality garage door, that they won’t have to deal with for many years. The difference between a garage door from the leading brands, to a basic garage door, is sometime a matter of 50-100$. And since you are not planning to replace the door every 2-3 years, do yourself a favor, and get a top quality garage door. repair the existing door, or replace it with a new one. Just remember, fixing the garage door is not always the best choice! If you would like to read more, click here. choices. Our fast, professional service lets you give your home and exterior makeover that will boost its value. When you need garage doors, parts, or repair, you should contact Ken Davidson Garage Doors, a premier Claremont contractor for over 40 years. We bring our decades of expertise to every customer we serve and back up our dedication to quality workmanship with a guarantee. Contact us at Ken Davidson Garage Doors to learn more about our products and services. understand your needs and potential repair solutions. An experienced technician will arrive at your home with truck stocked with all the parts and tools needed to complete your repair efficiently and safely. Also, Ken Davidson Garage Doors is a licensed Claremont contractor and BBB-certified, so you know you are getting the best possible repair service in your Claremont County home. choices that meet all your needs. With our prompt professional service, you can be enjoying a new garage door and an improved home appearance in no time. faulty garage door? Contact Ken Davidson Garage Doors right away. We offer prompt and professional garage door repair in Claremont. In addition, we offer competitive pricing and a work guarantee, so that you can rest assured that your money is being wisely spent.